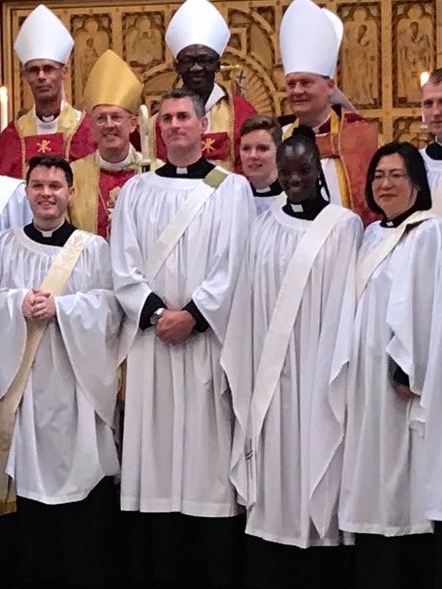 Congratulations to Steffan Mathias, Lindiwe Maseko and Yunghee Koh, who were ordained deacon on Saturday! 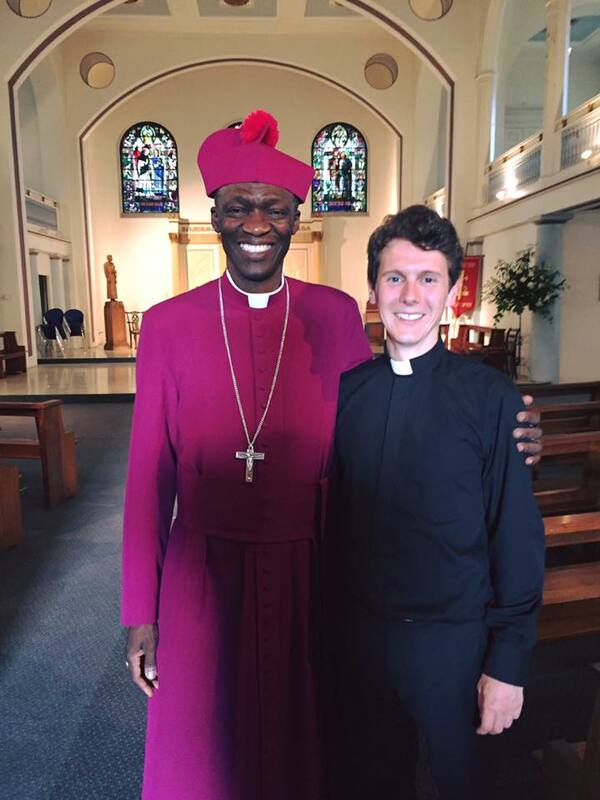 Steffan was our pastoral assistant in 2014-15, and is starting as curate at St Mary the Virgin Lewisham. Lindiwe was on placement with us in 2015, and will serve in the Ravensbourne Team Ministry. Young is a trustee of the Korean Mission Partnership, and will serve in the Wimbledon Team Ministry. Congratulations also to Fr Sam Hole, who was ordained priest last week. Fr Sam used to worship with us, and is now curate at St George the Martyr Borough. Please pray for Steffan, Lindiwe, Yunghee and Sam (see photos below). Our children's choirs will be singing for Mass (10.30am) and Evensong (3pm) in St John's College Chapel, Cambridge, on Sunday 31st July, at the end of their summer residential. We are organising a coach to Cambridge for the day - if you would like a place on it, please add your name to the list at the back of church, or email Bett (sjdk2012@yahoo.com). Adults £15, children £5. Brother's Mojalefa and Katleho - novices from the Society of the Sacred Mission in Lesotho - are spending alternate weeks on placement in the parish for the time being. Please give them a warm welcome. As part of the celebrations for the 10th Anniversary of The Robes Project, there will be a bake sale after Mass on Sunday 9th July. If you would like to bake something for this sale, please contact Jill Gregson (jill.gregson@talktalk.net). Deacon Stephen will continue his training in the parish of St John the Evangelist, Redhill. Please pray for Stephen. You can now follow both our church schools, as well as the parish, on twitter: @Saint_Gabriels, @SJDPrimary, and @sjdkennington. If you know of anyone who is unwell or missing from church, please inform one of the churchwardens or the clergy. 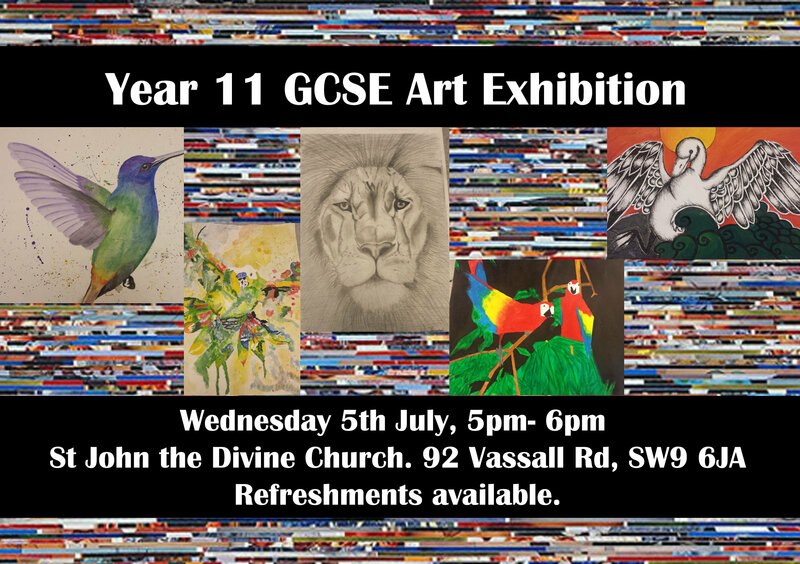 Saint Gabriel's College Art Exhibition (Wednesday 5th July, 4-6pm, in church): Members of the congregation and the public are welcome to join Saint Gabriel's College for a display of GCSE artwork in the church. Eagles (young adults group), Thursday 6th July, 7.30pm in the vicarage (92 Vassall Road): Bishop Peter Selby will lead a discussion on Inequality, followed by Compline at 9pm, and then drinks until 11pm. Please email jez.martin@gmail.com if you would like more information. Friday Walk (Friday 7th July). Everyone is welcome to join others from church for a bit of fresh air and exercise. The walk will be on Hampstead Heath, which will include fantastic views of London, Kenwood House and The Ponds. Meet at Oval Tube Station at 9.30am, or Hampstead tube station at 10am. Everyone is welcome – wear comfortable shoes, bring a snack and enjoy the exercise and company. No previous experience is needed. Phone Jeannie Morrison 07816 482626 for more details. GodTalk@SJDK (Thursday 13th July, with coffee from 7.15pm, starting at 7.30 in the Elsdale Room of the Community Centre): This is a group where we seek to learn with each other about what God is saying to us through the events of our time. We meet on the second Thursday of every month. All are welcome. At this month’s meeting Clare Rowe will lead a discussion on work-life balance. The meeting is followed by Compline in the church at 9pm. Ignatian Group (Wednesday 19th July, 7pm, at the vicarage - 92 Vassall Road, SW9 6JA). Please contact Fr Robert if you are interested (robssm@icloud.com). Feast of the Nativity of the Blessed Virgin Mary (Sunday 10th September): The Mass and procession will be followed by a barbecue in the Vicarage garden. All are welcome. Open church: Every weekday during school term, 3-6pm. Please speak to Emmanuel Adesoiye (omoadesioy@aol.com) if you can help. Coffee morning: From 10.30am on Mondays, with cake, tea and coffee will be available, followed by Mass at 12.15pm. Simply Divine (Every Tuesday, 6.30pm, in the Community Centre). This is our teenagers’ group, and all are welcome. For more information please email venessadenny@gmail.com speak to Venessa Denny or Timi Lijadu. Girls’ choir practice (Wednesdays, 3.45pm, during term time, in the Community Centre). Chamber choir practice (Wednesdays, 5.30-6.30, during term time, in the Community Centre). Boys’ choir practice (Thursdays, 3.45pm, during term time, in the Community Centre). Compline (Thursdays, 9pm, in the church). Dominoes Club (Will restart at the end of May, every Friday, 7.00 - 11.00pm, Community Centre). For further information please contact Lynda Phillips on 07946 646883. To celebrate Holy Week Father Mark led a special service at St John the Divine Kennington.